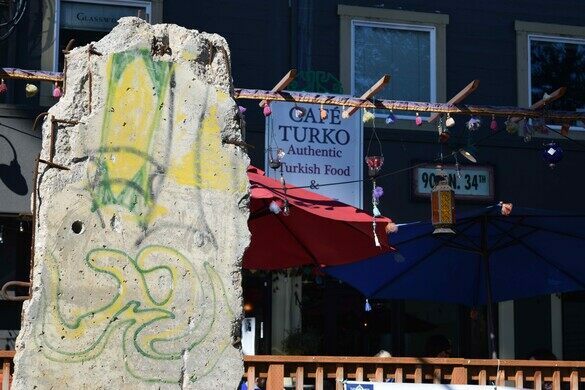 Just up the street from the J.P. Patches statue and right around the corner from the Fremont Troll is a quaint Turkish cafe featuring a nondescript little chunk of concrete that was once a piece of the Iron Curtain. 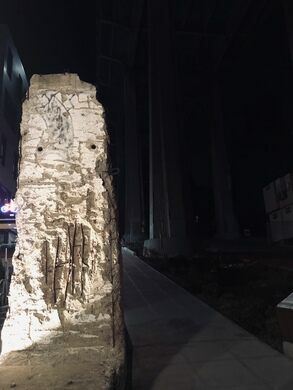 This concrete is actually a rare segment of the Berlin Wall. Standing at 6 feet by 12 feet, it is relatively minute compared to other preserved sections of the wall. Yet its presence invokes the same visions of poverty and despair that afflicted Germany during the Cold War. However, this piece of the Wall that stands in front of Cafe Turko is now just a part of the surrounding neighborhood. The waitstaff are nonchalant about their historic bauble, explaining that it came to them when the local “History House” museum closed up shop, offering the potentially priceless chunk of rebar and concrete to the restaurant simply for lack of a better alternative. From downtown Seattle, take the first exit after crossing the Aurora bridge. Take a right onto Woodland Park Ave N and another right onto 34th. Street parking is available but can fill up quickly. Stop between 10 AM and 9:30 PM for some authentic Kemal Pasha, though the bit of wall can be viewed anytime. Soviet intelligence had a keen interest in the Cold War linguistic school at this old Scottish airfield.